I think we were all rightfully shocked at how good The Lego Movie was. What madness is this that a movie based on a building toy we played with as children could be this smart, funny, inventive, and visually unique? Phil Lord and Chris Miller tapped into the imagination of the millions of kids who have ever played with Lego, while using Warner Bros.' extensive catalog of characters to the max. That we're braced for greatness this time removes some of the spontaneity and surprise of The Lego Movie 2: The Second Part, so while everything may not be awesome you're still likely to come away with a new upbeat track stuck in your head. That's right, it's earworm city as The Lego Movie 2 introduces yet another chirpy pop song that's bound to become a thing for far too long. It plays incessantly and without warning, literally telling you "This song's gonna get stuck in your head", and that's so true. Although for me, the best is saved for last with an outrageously funny closing credits sequence and music by those Lonely Island guys. Picking up right where the first film left off just after we've realized the adventures of Master Builder Emmet (Chris Pratt), Lucy (Elizabeth Banks), Lego Batman (Will Arnett) and the others were part of a real-life boy's crazy Lego imagination. The story ended with peace in Bricksburg, until the boy's sister arrived with her Duplo toys, promising to wreak shop. Five years zip by and the apocalypse has indeed come to Bricksburg, now christened Apocalypseburg, a Fury Road-esque Hellscape where the coffee is extra bitter and the Duplo toys constantly tear down any attempt to build something pretty. Not that Emmet seems to mind. He's as cheerful as ever, which pisses off Lucy who has grown more grim and wants desperately for Emmet to grow up. It isn't long before he gets the chance. A new enemy arrives in the armored form of General Mayhem, who kidnaps Lucy, Unikitty (Alison Brie), Batman, spaceship-obsessed Benny (Charlie Day), and Metalbeard (Nick Offerman) to the Systar System. There they are introduced to the seemingly-malevolent, shapeshifting Queen Watevra Wa-Nabi (Tiffany Haddish), who has big plans for them, specifically Batman. Emmet hops on his ship and teams up with supreme action hero Rex Dangervest (voiced by and a parody of Pratt) to save the day, and hopefully prove to Lucy that he's as tough as she wants him to be. 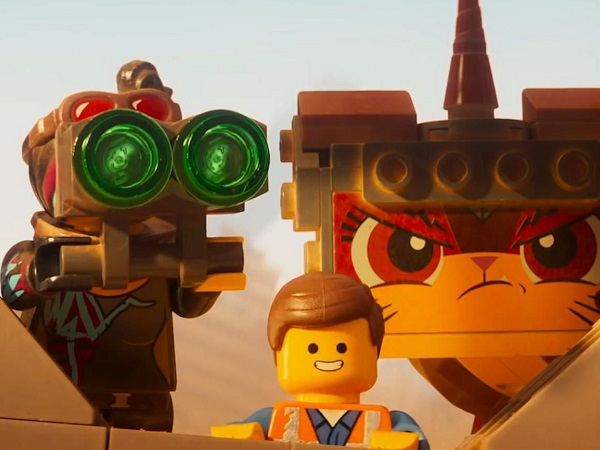 The same chaotic energy that I and many others loved about The Lego Movie is back, with the screenwriters (of which Lord and Miller are two of many) once again making the most of Warner Bros.' extensive stable of franchises. The best gags are often the most random, especially those that make use of some out-of-place character, my personal favorite being original Aquaman who is just a total loser. The jokes don't land with the same efficiency as before but they also never run out and you'll find yourself laughing more often than not. Whereas the real-world circumstances played as a big reveal before, they are sprinkled in rather frequently this time, as brother and sister (played by Jason Sand and The Florida Project's Brooklynn Prince) argue over Lego playtime while their mother (Maya Rudolph) tries to play referee. The shifts in style from animation to live-action are jarring at first but do settle down, although they tend to slow the action considerably, especially in the final act as more time is spent in our world. Since we're largely seeing things from a kid's point of view, the messages being sent are pretty easy to grasp and not everything makes sense, at least not to us adults. That doesn't excuse the film for lacking the same spark of creativity as its predecessor, which always felt fresh and new. While the voicework is strong all around, it's Pratt who gets to have a ball as both Emmet and Rex, the latter sounding like Kurt Russell straight out of Big Trouble in Little China. Rex is every bit the hero Emmet wants to be and gets credit for, although the script makes it a point to remind us that it was Lucy who did all the work. That doesn't necessarily leave Emmet in a good place, and sometimes he feels like an extra in his own movie. There's just so much going on, so many characters crammed into a movie that's just over 100 minutes long. Nobody gets quite the time they deserve, and that goes double for Haddish whose alien Queen Watevra Wa-Nabi gets one memorable song and not a lot else to do. But y'know, The Lego Movie 2 is just the second piece in what is an ever-growing series of movies. The sequel's story is pretty lean and doesn't wow like the first movie did, but it's fun and energetic which makes this toy box worth playing around in once again.